Nothing tops spring and its long days, humidity-free warmth and alfresco dining. Something I’m definitely not loving about spring right now, though, are my blistered, achy feet. My flats cause blisters herehereandhere while my sandals cause blisters therethereandthere, leaving the entire surface area of both feet swollen and bloodied. Ouch! The only pair of shoes that I own that don’t hurt are my Asics running shoes and, as much as I’d love to slip my poor feet into their cloud-life comfort, I don’t think my ego could bear the pain of a running-shoes-and-sundress combo. 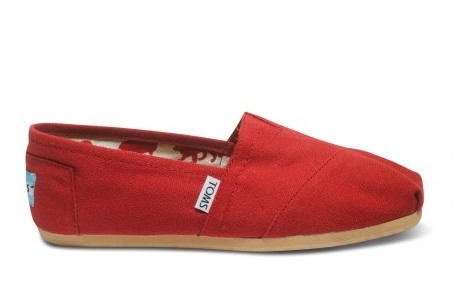 Maybe it’s time I invest in a pair of TOMS? I love their One for One policy (for every pair you purchase, TOMS gives a pair to a child in need) and I hear they’re super comfy. Are you having this problem with your spring footwear?? This entry was posted in Style and tagged asics running shoes, clothing, fashion, feet, flats, footwear, love, running shoes, sandals, shoes, spring, style, TOMS, TOMS one for one, write, writing by lovewritenow. Bookmark the permalink.